Married Name 1888 As of 1888,her married name was Peavy. R. E. Castle married Levi Daniel Peavy Jr. in 1888. Married Name 1913 As of 1913,her married name was Drush. Hattie Charlesworth married William C. Drush, son of John Drush and Mary Josephine Kramer, in 1913 at Fayetteville, Arkansas. Hattie Charlesworth died before June 1922. George W. Reed was born at New York. He married Sarah E. McCollough. Sarah E. McCollough married George W. Reed. Sarah E. McCollough was born circa 1828 at Virginia. William Reed was born circa 1860 at Wisconsin. Alice Reed was born circa 1864 at Wisconsin. She was the daughter of George W. Reed and Sarah E. McCollough. Name Variation Andrew Bear was also known as Baer. Andrew Bear was born on 5 February 1818 at Pennsylvania also reported as Ohio. He was the son of David Bear and Esther Nailor. Andrew Bear married Elizabeth Cornelia Morione Goont Kiefer, daughter of George Philip Keifer and Eva Marcia Roedel, in 1838. Andrew Bear died on 6 June 1854 at 36y 4m 1d at age 36. Like his brother Joshua, Andrew Bear died early in life, and there are but few now living who can remember him. It is said, however, that he married at Lexington, Ohio, where he lived for several years, and came to Wisconsin in 1848. He entered a farm at Spring Green in June of that year, where he lived until he died, June 6, 1854. He was one of the first settlers in Sauk county, Wis., and taught the first school in that county. He is said to have been a very influential man in church matters and a leader in school work. He united with the United Brethren Church at an early age, of which church he remained a consistent member up to the time of his death. Section 9 Twp 8-N Range 4-E Meridian 4th PM - 1831 MN/WI Counties Iowa, Sauk. 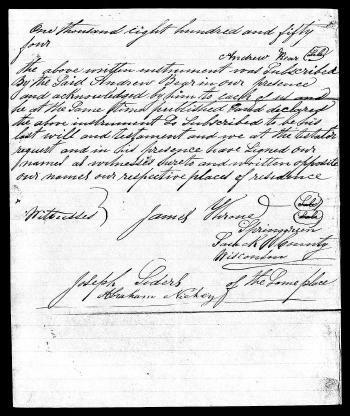 He left a will on 27 April 1854 at Sauk, Wisconsin. Name Variation John Drush was also known as Droesch. John Drush was born on 8 October 1840 at Helvetia, Switzerland. John Drush died on 17 May 1919 at St. Paul, Arkansas, at age 78. [S186] Illinois, Illinois Statewide Marriage Index, vol 006/ page 0223 license 00000955. Married Name 17 December 1868 As of 17 December 1868,her married name was Drush. Married Name 17 December 1868 As of 17 December 1868,her married name was Droesch. Mary Josephine Kramer was born on 9 May 1852 at Kiisnacht, Sulten, Switzerland. Mary Josephine Kramer died on 6 October 1942 at Ft. Smith, Arkansas, at age 90. James K. Craig was born on 28 December 1824 at Kentucky. He was the son of John Craig and Savilla Hanks. James K. Craig married Catherine Wilkinson on 25 February 1847. James K. Craig died on 24 June 1911 at age 86 James K. CRAIG, commonly known as "Uncle Jim" died at the home of his daughter, Mrs. T.M. SPYKER, June 24, 1911, aged 86 years, 5 months, and 26 days. He was born in Kentucky Dec. 28, 1824, came to Marion county, Ill., at the age of 12 years. His parents were John and Savilla CRAIG. His mother’s maiden name was HANKS, she being a sister of Nancy HANKS, the mother of LINCOLN. Uncle Jim was married Feb. 25, 1847 to Catherine WILKINSON, who was of Scotch descent. To them were born 9 children, 4 of whom are deceased, James, Samuel H., one in infancy, and Sarah A., who was the wife of M.H. SEE. 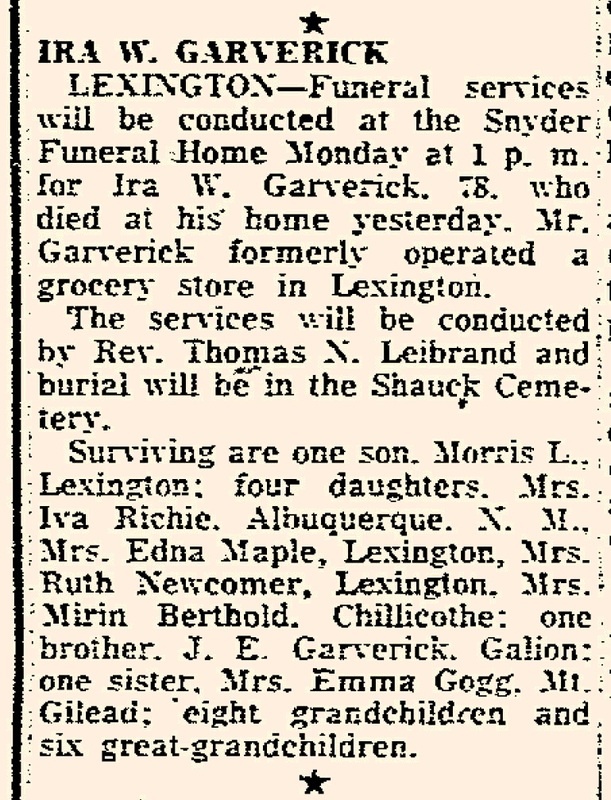 The surviving ones are Benjamin D., Jay H., John E., Elizabeth, the wife of T.M. SPYKER, and Ida, wife of Lemuel KENNEDY. In addition to these he leaves 16 grandchildren, and 5 great-grandchildren, his companion having died 20 years ago. He was the last survivor of his father’s family of 14 children and the last one of the early settlers of this vicinity who were about his age. Uncle Jim was a man of marked traits of character. Though his school advantages were meager, he was a close student and was clear and definite in his opinions upon all religious, political and social questions. He was never obtrusive with his opinion or advice, but a careful and safe advisor when advice was needed or desired. He was a man without ostentation and his good influence was not noticed by the multitudes but he was remarkable for his influence upon individual character and few in the community cannot tell of some simple incident in association with him which they cannot forget. This fact was mentioned by all who participated in the funeral service. His religious experience which began in his boyhood was satisfactory and definite, no mistranslation, mystery or severe Biblical criticism annoyed him. His faith in God rose above all these and he was never bothered by a single doubt. His selection of a text for his funeral sermon (Job 27:3-4) indicated his practical disposition in religious matters. His mind was clear to the end and he made all the arrangements for his own funeral. He was uncomplaining, cheerful and full of hope to the last. The funeral occurred at his home church Monday and was largely attended. The sermon by Rev. GARRETT of Odin, was extremely practical. Remarks were made by Revs. SIMERS, HOCKER, and SPYKER, and by W.W. NEIL all whom insisted upon Uncle Jim’s strong influence on individual character. Uncle Jim was loyal to his own church but was full of charity for other denominations. The pall bearers were his sons and grandsons. The music conducted by the MILLICAN and SIMERS families of Omega was of high character. 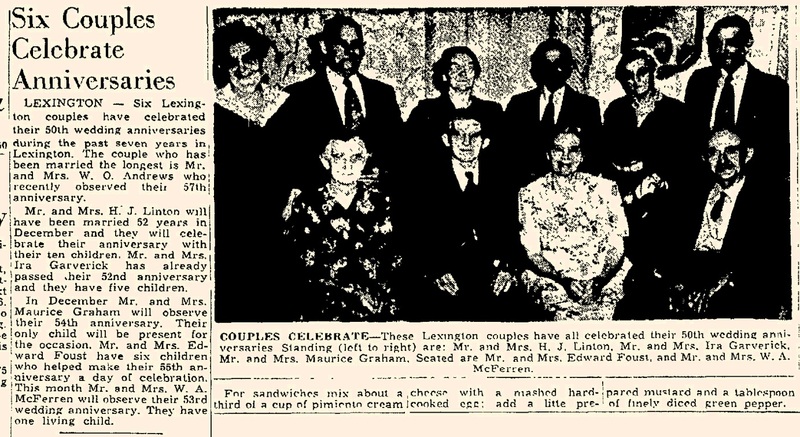 On 28 December 1907 Birthday DINNER: Saturday, Dec. 28th, 1907, being the 83rd birthday of Grandpa CRAIG his children, grandchildren and friends to the number of fifty, gathered at the home of L.N. KENNEDY in honor of the occasion. The day for several years has been the occasion for a home gathering and has long since ceased to be a surprise to the venerable gentleman, but is looked forward to each year as an occasion for hearty good cheer and merry making; accordingly everyone brought well filled baskets and at the noon hour all sat down to well laden tables, feeling it a pleasure to take dinner with Grandpa once more. While outdoors the sky was overcast with clouds, indoors everyone was in their merriest mood. The time was spent with music social conversation and when the hour for departure came, all went home feeling it was a day well spent and wishing for Grandpa many more happy birthdays. 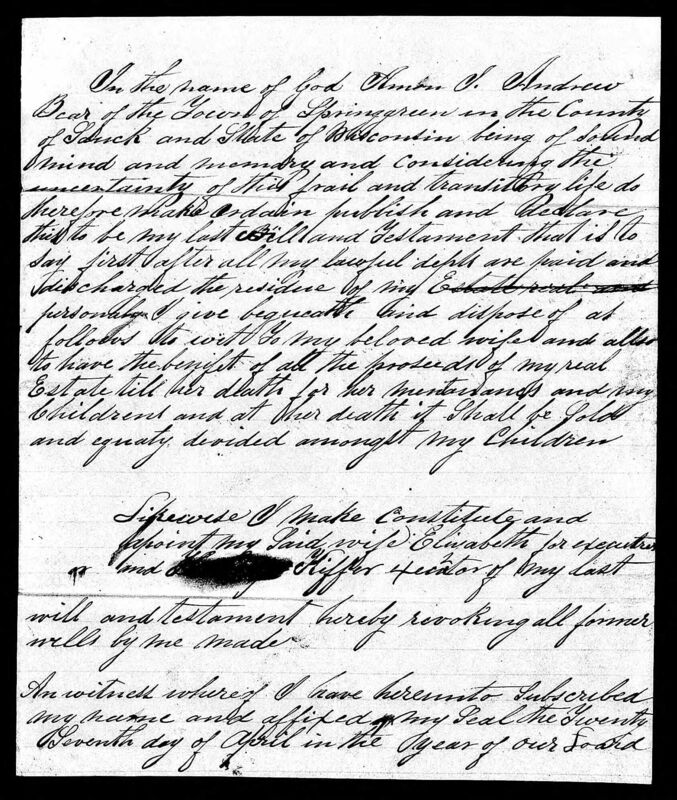 [S249] U.S. Federal Census 1850 U.S. Federal Census, by Ancestry.com, Stamp 64. Dwelling 929. [S248] U.S. Federal Census 1860 U.S. Federal Census, by Ancestry.com, Page 91. Dwelling 644. [S247] U.S. Federal Census 1870 U.S. Federal Census, by Ancestry.com, Page 18. Dwelling 124. 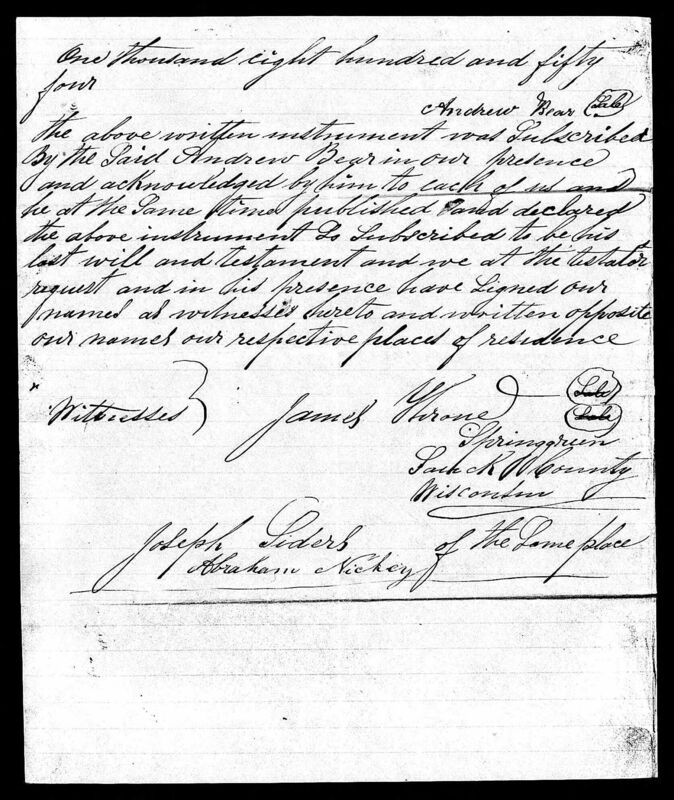 [S246] U.S. Federal Census 1880 U.S. Federal Census, by Ancestry.com, NA Film Number T9-0234 Page Number 106A. Name Variation Catherine Wilkinson was also known as Katherine. Married Name 25 February 1847 As of 25 February 1847,her married name was Craig. Catherine Wilkinson was born circa 1826 at Kentucky. She married James K. Craig, son of John Craig and Savilla Hanks, on 25 February 1847. Catherine Wilkinson died circa 1891. Samuel H. Craig was born circa 1858 at Illinois. 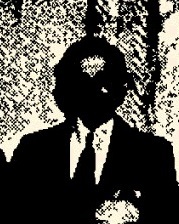 He was the son of James K. Craig and Catherine Wilkinson. Samuel H. Craig died before 1911. Name Variation Jay Hugh Craig was also known as Jehu. Name Variation Jay Hugh Craig was also known as Jaline. Jay Hugh Craig was born on 12 September 1860 at Marion, Illinois. Jay Hugh Craig died on 28 August 1912 at age 51 The subject of this sketch was born in Marion Co., Ill., Sept. 12, 1860. He spent his boyhood at the parental home until Feb. 4, 1883, when he joined in marriage to Delia S. RUSH. They resided on their farm, 3 miles southeast of Kinmundy, until the death angel called on the evening of Wed., Aug. 28, 1912, he being 51 years, 11 months, and 16 days of age. To this union was born one son, Harry F. of West Liberty, Ill. Besides the son, he leaves a wife, 2 brothers, B.D. and J.E. CRAIG, 2 sisters, Mrs. T.M. SPYKER and Mrs. L.N. KENNEDY, and a host of other relatives and friends. The deceased was converted 23 years ago in a meeting held by Rev. GARRETT, after which he joined the M.E. Church South. The funeral service was held at the residence on Friday morning at 10:30 conducted by Rev. W.J. SIMER, assisted tby Rev. A.D. HOCKER, father which interment was made in Evergreen Cemetery. In the death of Jay CRAIG the community has lost a good citizen and the home a kind and loving husband and father. [S186] Illinois, Illinois Statewide Marriage Index, vol 0OD/ page 0160. Married Name 1 March 1863 As of 1 March 1863,her married name was Kennedy. Ida Craig was born on 21 February 1863 at Omega, Marion, Illinois. She was the daughter of James K. Craig and Catherine Wilkinson. Ida Craig died on 17 March 1916 at age 53 Ida CRAIG KENNEDY died on March 17, 1916. She was born in Omega twp. on Feb. 21, 1863, and married Lemuel N. KENNEDY on March 1, 1863. They had six children: Myrtle, Katy, James, Bessie, Ruth and Naomi. 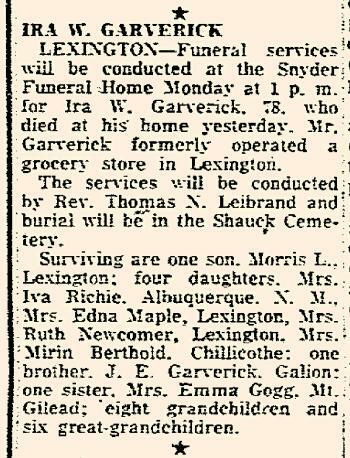 Surviving are her husband and children: Mrs. Oscar P. CURTIS of McClain, Mrs. Earl WILLIAMS of Kell, James KENNEDY of Alma, Mrs. Clarence WALKINGTON of Dix, and Ruth and Naomi. Interment in Evergreen Cemetery. 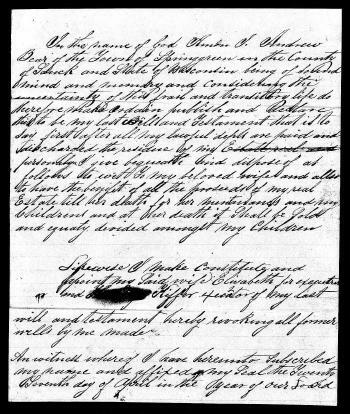 [S186] Illinois, Illinois Statewide Marriage Index, vol 0OD/ page 0161. [S245] U.S. Federal Census 1900 U.S. Federal Census, by Ancestry.com, ED16. Dwelling 242. John Edward Craig was born circa 1867 at Illinois. John Edward Craig died after August 1912. Ira Wellington Garverick was born on 20 May 1876 at Morrow, Ohio. He married Clara Alverda Yeager, daughter of Joseph Henry Yeager and Mary Elizabeth Klinefelter, circa 1898. Ira Wellington Garverick died on 8 April 1955 at Morrow, Ohio, at age 78 Ira Wellington Garverick obituary. 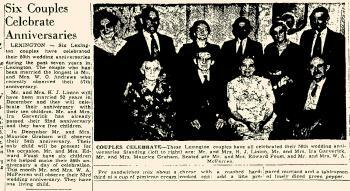 In 1950 at Ohio Ira and Clara (Yeager) Garverick 52nd anniversary celebration. Name Variation Margareth Klinefelter was also known as Margaret. Name Variation Margareth Klinefelter was also known as Kleinfelter. Margareth Klinefelter was born in 1850 at Ohio. She was the daughter of Jacob L. Klinefelter and Catherine Kiefer. [S248] U.S. Federal Census 1860 U.S. Federal Census, by Ancestry.com, Page 59-60. Dwelling 461. Name Variation Angeline Klinefelter was also known as Kleinfelter. Angeline Klinefelter was born in 1856 at Ohio. Name Variation Michael Klinefelter was also known as Kleinfelter. Michael Klinefelter married Elisabeth Lucas. Michael Klinefelter was born on 24 October 1795 at York, Pennsylvania. He was the son of Johannes Jacob Klinefelter and Julianna Ruhl. Michael Klinefelter died on 29 May 1868 at North Bloomfield, Morrow, Ohio, at age 72. Married Name Her married name was Kleinfelter. Married Name Her married name was Klinefelter. Elisabeth Lucas married Michael Klinefelter, son of Johannes Jacob Klinefelter and Julianna Ruhl. Elisabeth Lucas was born on 1 September 1793 at York, Pennsylvania. She died on 24 January 1873 at North Bloomfield, Morrow, Ohio, at age 79. Name Variation Johannes Jacob Klinefelter was also known as Kleinfelter. Johannes Jacob Klinefelter married Julianna Ruhl. Johannes Jacob Klinefelter was born on 4 August 1767 at Shrewsbury, Pennsylvania. He was the son of Johannes Klinefelter and Anna Margaretha Gerberich. Johannes Jacob Klinefelter died on 30 April 1830 at York, Pennsylvania, at age 62. Julianna Ruhl married Johannes Jacob Klinefelter, son of Johannes Klinefelter and Anna Margaretha Gerberich. Julianna Ruhl was born on 25 December 1771 at York, Pennsylvania. She died on 18 April 1843 at Marion, Ohio, at age 71. Name Variation Johannes Klinefelter was also known as Kleinfelter. Johannes Klinefelter married Anna Margaretha Gerberich. Johannes Klinefelter was born on 23 April 1739 at Florsbach, Hessen, Germany. Anna Margaretha Gerberich married Johannes Klinefelter. Anna Margaretha Gerberich was born on 3 July 1737 at Germany. Margaret Seiders was born on 24 July 1804. She was the daughter of Johannes Jacob Seiders and Margaretha Krick. Catharina Seiders was born on 14 October 1806. John Seiders married Prudence Stevens. John Seiders was born on 5 November 1808. He was the son of Johannes Jacob Seiders and Margaretha Krick. John Seiders died on 17 June 1879 at age 70. Hannah Seiders was born on 1 March 1813. Anna Maria Seiders was born on 3 August 1817. Rebecca Seiders was born on 25 April 1820.